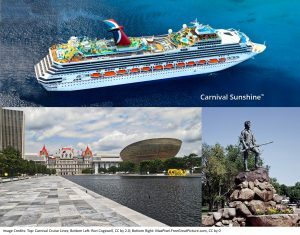 Image credits: Top Carnival Sunshine; Bottom Left: Empire State Plaza, Albany, (NY) 2015, Ron Cogswell, CC by 2.0; Bottom Right: Lexington Minuteman, MaxPixel.FreeGreatPicture.com, CC by 0. This year join the Geneva Historical Society and First Choice Travel for a fall foliage cruise, the quintessential New England experience or a day at the Empire State Plaza in Albany. Imagine spending time in September on board a luxury liner as you cruise around New England and Canada. The seven-day cruise aboard the Carnival Sunshine is from September 23 to September 30. Leaving from New York City ports of call are Boston, Massachusetts; Portland, Maine; St John, New Brunswick and Halifax, Nova Scotia. The trip also includes two fun days at sea on the Sunshine, enjoying its casino, shows, and other entertainments. Starting at $ 999 per person, the trip includes roundtrip motor coach transportation from Geneva to New York City, seven night cruise with meals and entertainment on ship, government taxes and fees. A $250 deposit is due with booking by July 1. From October 5 to October 7 enjoy the quintessential New England experience with a three day bus trip to Massachusetts. Activities include a visit to Plimoth Plantation with a Thanksgiving dinner, guided tours of Salem and the House of Seven Gables, a lobster bake with storytelling in Gloucester, guided tours of Lexington and Concord with visits to Sleepy Hollow Cemetery and Louisa May Alcott’s Orchard House, and the Boston Duck Walk. Participants will also have free time in Salem, Rockport, and Gloucester. The cost is $579.00 per person double occupancy and a $209 deposit is due with booking by March 31. The three-day trip includes motor coach transportation, tour manager, two nights’ accommodations, two breakfasts, two dinners, and all admissions. On December 5, spend time at the Empire State Plaza in Albany. As part of the 100th Anniversary of women’s suffrage in New York State, see the New York State Museum’s special exhibit Votes For Women: Celebrating New York’s Suffrage Centennial. Other activities include a visit to Corning Tower and a guided tour of the New York State Capital. The cost is $89 per person and a deposit is due by August 4. More information about these exciting excursions will be available at two informational meetings on Thursday, February 23 at 3:00 pm and 6:30 pm at the Geneva History Museum, 543 South Main Street.